What is intellectual property (IP)? Why is everyone always talking about it? What is the difference between hard and soft IP? What kind of jobs are there? What is the difference between prosecution and litigation? What kind of jobs are there if I DON’T have a tech/science background? What are the pros/cons of working at a boutique IP firm versus a general practice firm? IPLS will be hosting a lunch talk (Wednesday, October 11th, 3-4pm in room 370) answering all of these questions AND MANY MORE! Chicago-Kent’s own Professor Reilly will be providing a brief introduction to Intellectual Property. 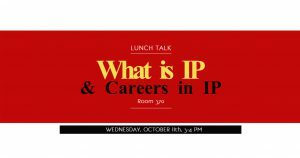 Our esteemed guests will be discussing the different types of IP and what kind of careers exist within IP.